Tension between the US and Turkey increased again on Sunday as the two countries suspended visa services at their respective diplomatic facilities in either country. The decision was first made by Washington after a Turkish staffer was arrested at the US consulate in Turkey for alleged links to the Pennsylvania-based opposition cleric Fethullah Gulen that Ankara accuses as the leading master of the 2016 failed coup d’Etat against President Recep Tayyip Erdogan. 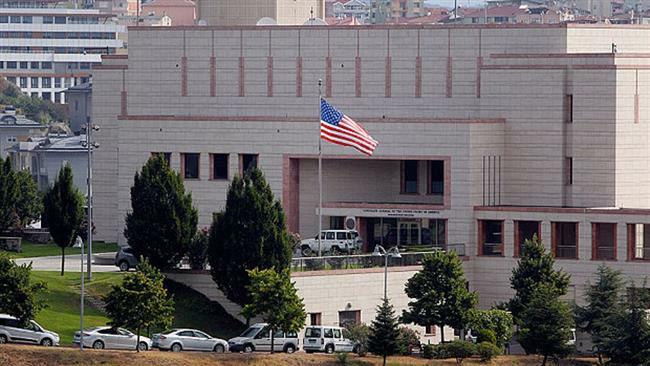 On Sunday evening, the US embassy in Ankara announced that “recent events” have forced the US government to reassess Turkey’s “commitment” to the security of US mission facilities and personnel. “In order to minimize the number of visitors to our embassy and consulates while this assessment proceeds, effective immediately we have suspended all non-immigrant visa services at all US diplomatic facilities in Turkey,” the statement said. Non-immigrant visas are issued to the media as well as to people wishing to travel to the US for tourism, education, medical treatment, or business. Just hours after the US decision, Turkey retaliated through its embassy in Washington issuing a word-for-word copy statement that suspends non-immigrant visas to US citizens. The arrest of the Turkish staffer is explained by pundits as being part of what they call “hostage-taking” strategy by the Turkish president to get US concessions. According to analysts, the Turkish president seeks to exert pressure on Washington for the release of Turkish businessmen arrested in the US for violating the Iran sanctions. Written by: Peter Mulvany on October 9, 2017. Posted by Peter Mulvany on Oct 9 2017. Filed under Headlines, World News. You can follow any responses to this entry through the RSS 2.0. Both comments and pings are currently closed.